Businesstraveller.com brings you the latest travel gadgets and accessories, available this Christmas, to make life on the road easier. This week: The Samsung Galaxy Tab, HTC Desire HD and Fujifilm’s 3D digital camera. Also, Google Maps 5.0. Samsung really went all out to get its new Galaxy Tab noticed, with most high street mobile phone and technology retailers scrambling to offer deals on the device. Its main selling point, apart from running the excellent Android 2.2 Froyo operating system, is its size when compared to its main rival, the iPad. Its seven inch screen means it’s less cumbersome than the iPad, and can even fit in pockets (albeit relatively large ones). While Google maintains that its Android OS is not meant for tablets, only mobile phones, the Samsung Galaxy Tab uses it well. The Tab has 3G and wifi, and its built-in browser supports flash. Samsung has even released a number of special apps to make use of the Galaxy Tab’s screen size, as most Android apps are designed for smartphone-sized screens. Of all the Android-powered tablets to emerge in recent months, the Samsung is arguably the one with the highest profile. The HTC Desire HD’s name is perhaps slightly misleading. Rather than be, as the name suggests, the HTC Desire but with a higher resolution, the HD is significantly larger in terms of screen size, and has markedly different looks. The HD doesn’t have the grey metallic case of its older sibling, rather its shiny black styling is more of the iPhone ilk. The most notable thing about the HD is its enormous 4.3” screen that despite being power-hungry makes for an excellent internet browsing and entertainment experience. The HD also has Dolby Mobile and SRS virtual surround sound speakers, and runs Android 2.2 Froyo with HTC Sense. Other notable features include an 8MP camera, 720p HD video recording and a blisteringly fast 1GHz processor. 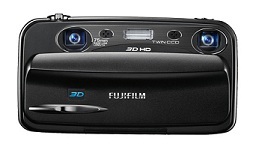 Fujifilm’s FinePix REAL 3D W3 digital camera shoots 2D and 3D images and high definition video through its dual 10MP lenses, which mimic the position of one’s eyes. The results can be seen immediately, on the camera’s view screen, without the need for special glasses, or when connected to any 3D-ready TV via the HDMI connection. Images can also be printed onto special “lenticular” paper, creating a 3D picture again without the need for glasses. Google Maps is arguably one of the most useful apps available on any smartphone, and if not then it is under appreciated. Whether you’re a fan of apps featuring augmented reality, spirit levels, toilet locators or angry birds, no matter what your inclination you’re at some point going to find yourself geographically challenged. Google Maps has remained largely unchanged since its birth five years ago, with its 2D, north-pointing maps and reliance on a strong connection. But with the release of Version 5 comes a dramatic new look, with 3D interactive maps. Instead of downloading segments of 2D maps, the new app will draw the buildings in 3D as you go. Finger gestures allow users to tilt and rotate the view. Version 5 also incorporates clever map caching that stores map data for the most visited areas, meaning an end to the slow, square-by-square loading times.